Bella has been playing soccer for quite awhile now. She absolutely loves the sport. One of the things she asked me if she could do this summer was sign up for a soccer camp. 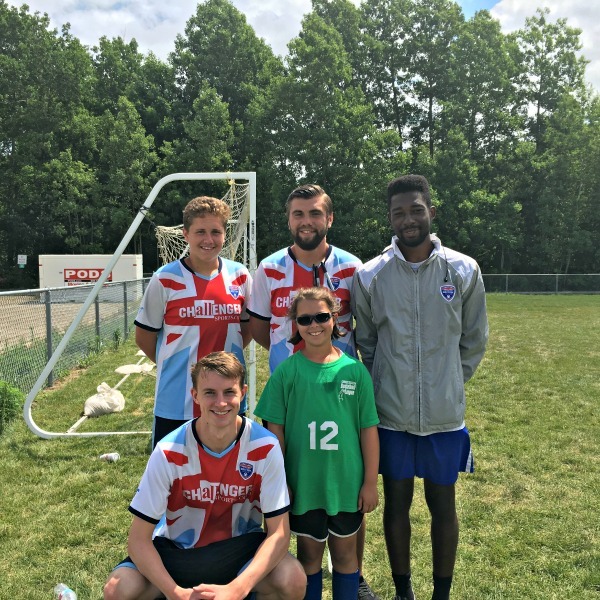 So, being the fabulous mom I am, I arranged for her to attend one of the Challenger Sports British Soccer Camps. While I was signing her up for that, I noticed that they also had a Goal Keeping and Goal Scoring camp to in the afternoon. Since she's a goalie, I signed her up for both!! 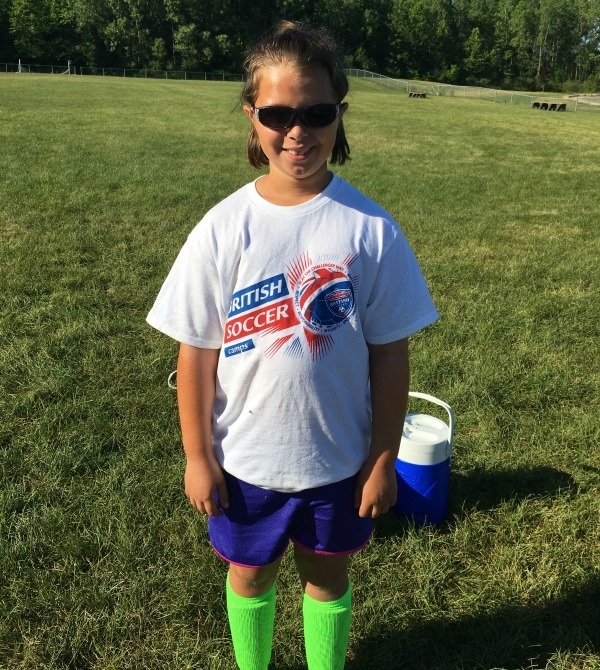 Last week she attend the British Soccer Camps from 9 am until 3 pm, Monday through Friday! She was beside herself with excitement! She had a great time! I was really unsure if the 9 am - 3 pm would be too much for her, but it wasn't. She only wished that there was a real bathroom facility at this park, as opposed to out houses. She was not a fan of those! Bella enjoyed all the drills they played and especially liked playing World Cup...her team came in second! Bella also really loved her coaches. She was rather sad on the last day that she had to say goodbye to them. She enjoyed learning from them, as well as talking to them. "They had awesome accents"! The coach in the back left was from Ireland; the two coaches behind Bella were from London; and the coach next to Bella was from Scotland. One of my favorite things was listening to the kids try to mimic the coaches accents or asking the coaches to "talk like an American". Both were hysterical! Overall, Bella had a really great week. The goalie camp was especially good for her because she was taught how to dive for the ball...something she wasn't all that sure about. She's now a diving pro! If you are wondering if there is a Challenger Sports camp near you, check out their website! I know, in my area, we have a few more going on! These four guys will be the coaches at this same field again next year and Bella is already asking to sign up again!